The thief Widdershins and her own “personal god,” Olgun, return to their home city of Davillon after almost a year away. While Shins expects only to face the difficulty of making up with her friends, what she actually finds is far, far worse. Her nemesis, Lisette, has returned, and she is not alone. Lisette has made a dark pact with supernatural powers that have granted her abilities far greater than anything Widdershins and Olgun can match. Together, Widdershins and Olgun will face enemies on both sides of the law, for Lisette’s schemes have given her power in both Davillon’s government and its underworld. For even a slim chance, Shins must call on both old friends-some of whom haven’t yet forgiven her-and new allies. Even with their help, Widdershins may be required to make the hardest sacrifice of her life, if she is to rid Davillon-and herself-of Lisette once and for all. 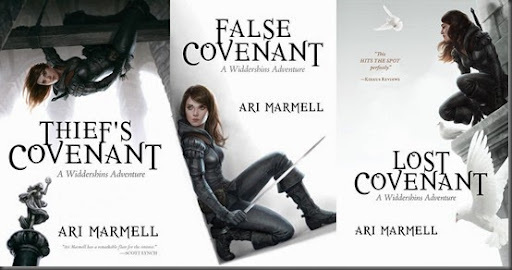 Covenant’s End is due to be published by Pyr Books in February 2015. So, that’s rather a long way away (damnit! ), but it’s nice to be able to share the artwork. Marmell’s latest novel is Hot Lead, Cold Iron – the first in his Mick Oberon urban fantasy series set in 1930s Chicago – published by Titan Books in the US (out now) and UK (out next week).